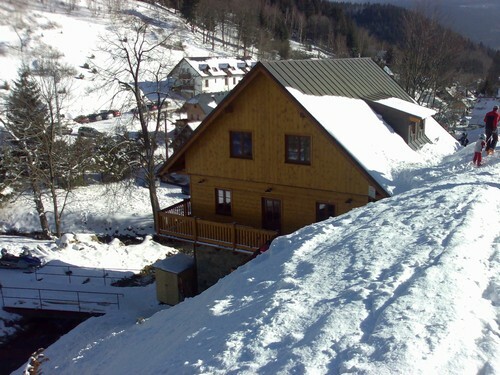 Cottage Pod Krizem is situated next to the bottom station of longer ski tow of SKI PETRIKOV areal and so you can jump from pyjamas directly to ski boots. Cottage offer totally 20 beds in 4 beds and 3 beds rooms. Each room has its own sanitary facility with shower bath and WC. In the house you can also use common kitchen with dishes, fridge, cooker, microwave and washer – up. Thanks to the proximity of skiing slops is cottage ideal to families with the children. Dogs are not allowed. Also like in the Hasicska zbrojnice accommodation in the cottage Pod Krizem guests in high season can be housed from 14:00 hours on the Saturday. Room must leave at the latest 10:00 hours. In the low season can be length of stay obtain individually. Pricelist of Cottage "Pod krizem"